(Nanowerk News) Like a baseball player sliding into third, a hot monomer skids in a straight line along a cold surface until it's safely among its fellow molecules. This is not what usually happens when scientists assemble monomers to make thin films for next-generation electronics, but the details remained a puzzle until a team led by Rice University got involved. Monomers are organic molecules that, in this application, form clusters and eventually complete layers. Researchers at Rice and the University of Maryland led by Rice theoretical physicist Alberto Pimpinelli devised the first detailed model to quantify what they believe was the last unknown characteristic of film formation through deposition by vacuum sublimation and chemical vapor deposition. Their work appears today in Physical Review Letters ("How “Hot Precursors” Modify Island Nucleation: A Rate-Equation Model"). Scientists make films as thin as a single molecule in the same way they make graphene: They heat a gas in a furnace and wait for its bits to condense and aggregate into a solid. Molecules in the gas hit a surface (typically mica in experiments, often silicon in applications) called a substrate, where they accumulate into a regular lattice. Usually, according to Pimpinelli, organic molecules drawn by weak van der Waals forces alight on the substrate and skitter randomly from one point to another under the influence of vibrating phonons in the substrate's crystalline lattice until they bump into another molecule or, more likely, an island of other molecules to join. Islands that gather enough monomers create a critical nucleus: Take one away and all of them could disassociate; add one and the nucleus becomes a stable structure able to join with other growing islands to form the film. Researchers understand how this happens, Pimpinelli said. But when the substrate is cool enough to dampen its natural vibrations (for pentacene on mica, at about minus 190 degrees Fahrenheit) and the gas is hot enough, the molecules hit the substrate and skid in a straight line along its surface, which scientists call ballistic motion. If they skid to a stop, they will wander until they find an island -- or growing islands find them. "The common wisdom has been that when molecules or atoms arrive at a substrate, their kinetic energy immediately dissipates into the substrate crystal," Pimpinelli said. "Their energy is essentially zero when they arrive at the surface, and they diffuse at random. But what happens if they don't, if the energy is preserved long enough that the molecule keeps its velocity at the surface and continues on in a line? Traditionally, this aspect has been totally neglected." These skidding molecules can make islands grow, or knock other molecules off islands at or below the critical nucleation stage, perhaps even causing them to disassociate, he said. Pimpinelli said nobody had successfully created a mathematical model that detailed the conditions under which ballistic, "nonthermal" motions could continue even after a molecule is adsorbed by the substrate. "We already had a powerful mathematical framework for aggregation on surfaces," he said. "We have ways to describe in a lot of detail what happens to atoms, and can transfer those models lock, stock and barrel to these molecules -- except for one: the 'hot' monomer. "Because these hot monomers profoundly affect island nucleation, it's important for experimentalists to know how and why this happens," Pimpinelli said. The speed of island growth affects their size, which in turn affects the size of the electrically significant boundaries that form when they come together. These grain boundaries tend to decrease the electrical and thermal conductivity of a material. 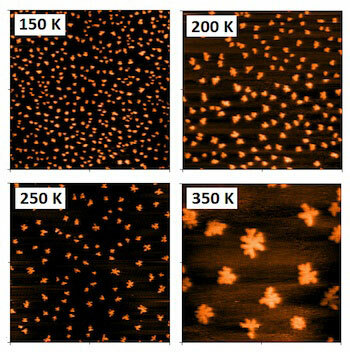 Pimpinelli took on the project when experimental associates in Austria observed that when they tried to grow films on cold substrates, clusters of organic molecules would form in a way that was only compatible with ballistically moving monomers. Pimpinelli's collaborators were graduate student Josue Morales-Cifuentes and physics professor Theodore Einstein of the University of Maryland. "With a low-temperature substrate, you will not see as much thermal motion, in which molecules hop here and there at random," Pimpinelli said. "Clearly there was a different mechanism leading to a qualitative change in the islands they observed with an atomic force microscope." Pimpinelli said quick calculations involving the temperature of the substrate and the deposition rate of the monomers suggested the system could be modeled; more complex mathematics not only confirmed it, but also provided a way to predict how various molecules and substrates will interact at specific temperatures. "By studying how the number of islands changes with these control parameters, one is able to know the size of the critical nucleus, the diffusion process, all the energies involved and how these molecules bind to each other and the substrate," he said. "All the information, in principle, can be extracted by counting the islands on the surface."